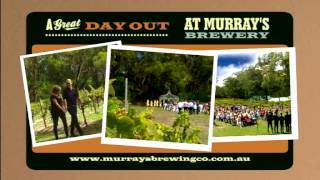 Port Stephens based Murray's Craft Brewing Co. is one of Australia's leading craft beer brewers, sharing its home with the region's oldest winery, Port Stephens Winery. From humble beginnings at The Pub With No Beer in Taylors Arm (population 50) on the NSW North Coast just over seven years ago, Murray's Brewery relocated its brewery to larger premises at Port Stephens in 2009 where today it runs a micro brewery, Cellar Door and one of the region's best restaurants. Visitors can taste Murray's beers - as well as local and regional wines, dine at the Brewery Restaurant (which specialises in food made with and matched to beer), play bocce on the outdoor court, listen to live music every weekend, and relax and enjoy the beautiful eucalypt and vine surrounds.